If you check, You Gov’s midweek poll for last week, you will find they forecast, as follows. CON 29%, LAB 42%, LD 11%, UKIP 18%; the field work was done between the 21st and 23rd May. 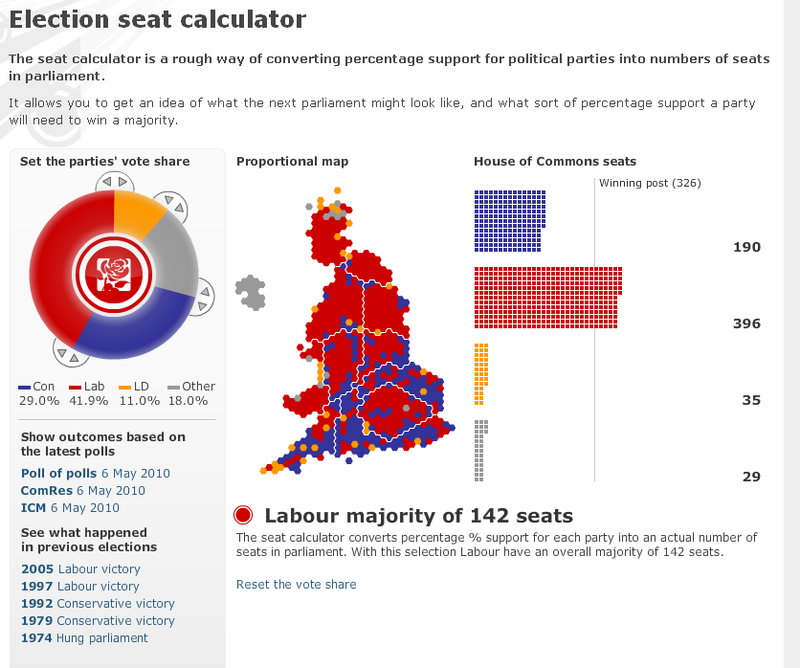 If you then go to the BBC’s House of Commons Seat Calculator, and set the dial as You Gov suggest, you get the following result. A Labour Majority of 142, with the seats as follows, CON 190, LAB 396, LD 35 and the Rest at 29. This is on a scale of Tony Blair’s 1997 Victory. There are a number of problems with this model, it is based on 2005 results, and there have been boundary changes since, it assumes an even swing which probably discriminates against the Lib Dems who claim a positive incumbency factor, and it almost certainly underestimates the Scottish Nationalists. It’s a shame that there is no ‘hover’ over the seats to see which seat is which. Other potential long or medium term factors i.e. the increasing xenophobia and the rise of UKIP are likely to be under-estimated or ignored. The YouGov report does count and report on the UKIP and SNP voting intentions. I have placed the you gov news page and the BBC page together with Political Betting’s home page on my Blogroll. This is already out of date, YouGov published a further poll with field work conducted over the 23rd and 24th May in last weekend’s Sunday Times, with the Tories having stolen 1% from the Liberal Democrats.